There are 7 campgrounds and 14 backcountry campsites within the Great Smoky Mountain National Park. This page will only cover vehicle accessible campgrounds located within the park. Use this park map to locate the areas the campgrounds are in. Campsites at Elkmont, Smokemont, and Cades Cove may be reserved between May 15 - October 31st. For reservations call 1-800-365-2267 (park code GRE) or visit the National Park Service reservation web site at http://reservations.nps.gov. Cades Cove and Smokemont campgrounds are open year round. Every campground in the park has restrooms with flush toilets, but none of the campgrounds have showers, electric or water hook-ups. 161 campsites open year-round. Probably the most popular campground in the Great Smoky Mountains National Park. It provides bicycle or foot access to an eleven mile, one-way loop road popular with bicyclist, walkers, and runners. Cades Cove is also a good starting point for backpacking and hiking trips. 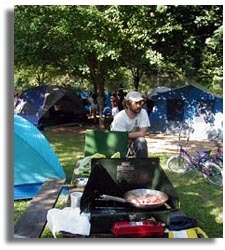 Cades Cove has tent campsites, camping sites for RV's & trailers and group camping. Also at this location is a ranger station, small store, restrooms, telephone, bicycle rental, horseback riding, dumping station and more.